Our Clear Glass Splashbacks are made from Low Iron Glass meaning they are truly clear. If you want the functionality and benefits of a glass splashback without any added colour, a clear splashback is ideal. 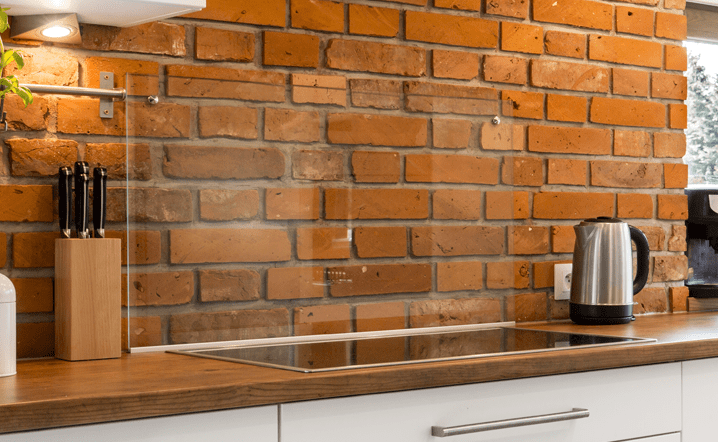 So if you have a feature wall covered will wallpaper or an industrial brick wall, then a clear glass splashback is the ideal solution. A clear glass splashback adds a polished, tidy feel to any kitchen counter while simultaneously protecting your walls. All of our Glass Splashbacks are created from Low Iron Glass, for our Clear Glass Splashbacks this means it really is clear, no green tinge. No matter which one of our splashbacks you choose, whether it’s, clear, coloured, printed or mirrored they are all made from Toughened Glass. Not only does this give you protection against knocks and bangs, you can even throw a pan at it and it won’t break, it is also heat resistant to over 400°C, so you can be safe in the knowledge that it will never crack from heat. (non-toughened glass will). Here at Pro Glass 4 were firm believers in being able to create a bespoke glass splashback that fits your own tastes and style. Which is why our easy to use website allows you to choose any colour in any size and unlike some suppliers we don’t charge extra for different colour brands. Once you have created your own unique splashback, choose from our two easy fitting options, to finish off your order. Take a look at our easy to understand Tutorials on How To Measure & How To Install your Glass Splashback. To ensure the best possible fit for your bespoke glass splashback, we take off an expansion gap, 2mm from the top and 2mm from each side. So you don’t need to worry about writing down any more numbers. If you would like us to create an exact size please let us know and we will be happy to do this for you. Our Low Modular Specialist Adhesive has been designed specifically for our glass splashbacks. Unlike most adhesives it has been designed to not react with the paint of the splashback, ensuring you have a splashback that looks as stunning as the day you bought it in 10 years time. For our Clear Glass Splashbacks we recommend having four holes so it can be installed with screws rather than adhesive, if you were to use adhesive you would see the adhesive and no one wants that. Set 50mm from each corner as standard, if you would like them in a different position please let us know, we recommend using screw head covers for the finished look. All of our Glass Splashbacks come with a 10 Year warranty as standard. So you can be sure that your splashback will look fantastic for years to come. Only valid when using our own specialist adhesive. We aim to deliver all of our glass splashbacks within 10-14 Working Days. We do however keep some sizes in stock,(see below), and these can usually be delivered in around 1 week. Our delivery days are Tuesday – Friday via APC, if you have a preferred day of delivery please let us know and we will do our best to accommodate your request.